For other uses, see Bagel (disambiguation). Though the origins of bagels are somewhat obscure, it is known that they were widely consumed by Ashkenazi Jews from the 17th century. The first known mention of the bagel, in 1610, was in Jewish community ordinances in Kraków, Poland. Bagels are now a popular bread product in North America, especially in cities with a large Jewish population, many with alternative ways of making them. Like other bakery products, bagels are available (fresh or frozen, often in many flavors) in many major supermarkets in those cities. The basic roll-with-a-hole design is hundreds of years old and has other practical advantages besides providing more even cooking and baking of the dough: The hole could be used to thread string or dowels through groups of bagels, allowing easier handling and transportation and more appealing seller displays. Linguist Leo Rosten wrote in The Joys of Yiddish about the first known mention of the Polish word bajgiel derived from the Yiddish word bagel in the "Community Regulations" of the city of Kraków in 1610, which stated that the food was given as a gift to women in childbirth. In the 16th and first half of the 17th centuries, the bajgiel became a staple of Polish cuisine and a staple of the Slavic diet generally. Its name derives from the Yiddish word beygal from the German dialect word beugel, meaning "ring" or "bracelet". Variants of the word beugal are used in Yiddish and in Austrian German to refer to a similar form of sweet-filled pastry (Mohnbeugel (with poppy seeds) and Nussbeugel (with ground nuts), or in southern German dialects (where beuge refers to a pile, e.g., holzbeuge "woodpile"). According to the Merriam-Webster dictionary, 'bagel' derives from the transliteration of the Yiddish 'beygl', which came from the Middle High German 'böugel' or ring, which itself came from 'bouc' (ring) in Old High German, similar to the Old English bēag "ring" and būgan "to bend, bow". Similarly, another etymology in the Webster's New World College Dictionary says that the Middle High German form was derived from the Austrian German beugel, a kind of croissant, and was similar to the German bügel, a stirrup or ring. In the Brick Lane district and surrounding area of London, England, bagels (locally spelled "beigels") have been sold since the middle of the 19th century. They were often displayed in the windows of bakeries on vertical wooden dowels, up to a metre in length, on racks. Bagels with cream cheese and lox (cured salmon) are considered a traditional part of American Jewish cuisine (colloquially known as "lox and a schmear"). Bagels were brought to the United States by immigrant Polish Jews, with a thriving business developing in New York City that was controlled for decades by Bagel Bakers Local 338. They had contracts with nearly all bagel bakeries in and around the city for its workers, who prepared all their bagels by hand. The bagel came into more general use throughout North America in the last quarter of the 20th century with automation. Daniel Thompson started work on the first commercially viable bagel machine in 1958; bagel baker Harry Lender, his son, Murray Lender, and Florence Sender leased this technology and pioneered automated production and distribution of frozen bagels in the 1960s. Murray also invented pre-slicing the bagel. Around 1900, the "bagel brunch" became popular in New York City. 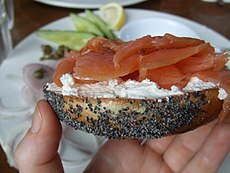 The bagel brunch consists of a bagel topped with lox, cream cheese, capers, tomato, and red onion. This and similar combinations of toppings have remained associated with bagels into the 21st century in the US. In Japan, the first kosher bagels were brought by BagelK [ja] from New York in 1989. BagelK created green tea, chocolate, maple-nut, and banana-nut flavors for the market in Japan. There are three million bagels exported from the U.S. annually, and it has a 4%-of-duty classification of Japan in 2000. Some Japanese bagels, such as those sold by BAGEL & BAGEL [ja], are soft and sweet; others, such as Einstein Bro. bagels sold by Costco in Japan, are the same as in the U.S.
At its most basic, traditional bagel dough contains wheat flour (without germ or bran), salt, water, and yeast leavening. Bread flour or other high gluten flours are preferred to create the firm, dense but spongy bagel shape and chewy texture. Most bagel recipes call for the addition of a sweetener to the dough, often barley malt (syrup or crystals), honey, high fructose corn syrup, or sugar, with or without eggs, milk or butter. Leavening can be accomplished using a sourdough technique or a commercially produced yeast. This production method gives bagels their distinctive taste, chewy texture, and shiny appearance. In recent years, a variant has emerged, producing what is sometimes called the steam bagel. To make a steam bagel, the boiling is skipped, and the bagels are instead baked in an oven equipped with a steam injection system. In commercial bagel production, the steam bagel process requires less labor, since bagels need only be directly handled once, at the shaping stage. Thereafter, the bagels need never be removed from their pans as they are refrigerated and then steam-baked. The steam bagel results in a fluffier, softer, less chewy product more akin to a finger roll that happens to be shaped like a bagel. Steam bagels are considered lower quality by purists as the dough used is intentionally more alkaline. The increase in pH is to aid browning, since the steam injection process uses neutral water steam instead of an alkaline solution bath. Bagels can be frozen for up to six months. According to a 2012 Consumer Reports article, the ideal bagel should have a slightly crispy crust, a distinct "pull" when a piece is separated from the whole by biting or pinching, a chewy inside, and the flavor of bread freshly baked. The taste may be complemented by additions cooked on the bagel, such as onion, garlic, sesame seeds, or poppy seeds. The appeal of a bagel may change upon being toasted. Toasting can have the effect of bringing or removing desirable chewiness, softening the crust, and moderating off-flavors. A typical bagel has 260–350 calories, 1.0–4.5 grams of fat, 330–660 milligrams of sodium, and 2–5 grams of fiber. Gluten-free bagels have much more fat, often 9 grams, because of ingredients in the dough to supplant the wheat flour of the original. The Montreal-style bagel contains malt and sugar with no salt; it is boiled in honey-sweetened water before baking in a wood-fired oven. It is predominantly of the sesame "white" seeds variety (bagels in Toronto are similar to those made in New York in that they are less sweet, generally are coated with poppy seeds and are baked in a standard oven). In contrast to the Montreal Style Bagel, the New York bagel contains salt and malt and is boiled in water before baking in a standard oven. The resulting bagel is puffy with a moist crust. The Montreal bagel is smaller (though with a larger hole), crunchier, and sweeter. There is a local belief that New York bagels are the best due to the quality of the local water. However, this belief is heavily debated. For instance, Davidovich Bagels, made in NYC, are a recognized wholesale manufacturer of bagels that use these traditional bagel-making techniques (associated here with the Montreal-style bagel), including kettle boiling and plank baking in a wood fired oven. The East Coast style bagel has qualities that compare to the New York-style bagel and Montreal-style bagel, while also uniquely incorporating sourdough. This sourdough mixture features a unique set of ingredients only found in Halifax, in the form of locally sourced wild yeasts. The East Coast-style bagel is not as chewy and fluffy, nor as salty as the New York-style bagel, and is less dense, doughy and sweet than a Montreal-style bagel, with an added dash of San Francisco influence. The St. Louis style bagel refers not to composition, but to a particular method of slicing the bagel. The St. Louis style bagels are sliced vertically multiple times, instead of the traditional single horizontal slice. The slices range from 1/4 to 1/8 inches thick. This style of bagel was popularized by the St. Louis Bread Company, now known as Panera Bread. Generally, the bagels are sliced into eight pieces using a bread slicer, which produces characteristically precise cuts (e.g., the bagel is not torn or crushed while slicing). This particular method of preparation increases the surface area available for spreads (e.g., cream cheese, butter). However, it decreases the portability of the bagel and prevents formation of sandwiches. As suggested above, other bagel styles can be found elsewhere, akin to the way in which families in a given culture employ a variety of methods when cooking an indigenous dish. Thus, Chicago-style bagels are baked or baked with steam. The traditional London bagel (or beigel as it is spelled) is harder and has a coarser texture with air bubbles. Poppy seeds are sometimes referred to by their Yiddish name, spelled either mun or mon (written מאָן), which comes from the German word for poppy, Mohn, as used in Mohnbrötchen. American chef John Mitzewich suggests a recipe for what he calls “San Francisco-Style Bagels”. His recipe yields bagels flatter than New York-style bagels, characterized by a rough-textured crust. An everything bagel may include such toppings as poppy seeds, sesame seeds, onion flakes, caraway seeds, garlic flakes, pretzel salt, and pepper. While normally and traditionally made of yeasted wheat, in the late 20th century variations on the bagel flourished. Non-traditional versions that change the dough recipe include pumpernickel, rye, sourdough, bran, whole wheat, and multigrain. Other variations change the flavor of the dough, often using blueberry, salt, onion, garlic, egg, cinnamon, raisin, chocolate chip, cheese, or some combination of the above. Green bagels are sometimes created for St. Patrick's Day. Many corporate chains now offer bagels in such flavors as chocolate chip and French toast. Sandwich bagels have been popularized since the late 1990s by specialty shops such as Bruegger's and Einstein Brothers, and fast food restaurants such as McDonald's. Breakfast bagels, a softer, sweeter variety usually sold in fruity or sweet flavors (e.g., cherry, strawberry, cheese, blueberry, cinnamon-raisin, chocolate chip, maple syrup, banana and nuts) are common at large supermarket chains. These are usually sold sliced and are intended to be prepared in a toaster. A flat bagel, known as a 'flagel', can be found in a few locations in and around New York City, Long Island, and Toronto. According to a review attributed to New York's Village Voice food critic Robert Seitsema, the flagel was first created by Brooklyn's 'Tasty Bagels' deli in the early 1990s. Though the original bagel has a fairly well-defined recipe and method of production, there is no legal standard of identity for bagels in the United States. Bakers are free to call any bread torus a bagel, even those that deviate wildly from the original formulation. totaled to US$430,185,378 based on 142,669,901 package unit sales. the top eight leading brand names for the above were (by order of sales): Thomas', Sara Lee, (private label brands) Pepperidge Farm, Thomas Mini Squares, Lender's Bagels (Pinnacle Foods), Weight Watchers and The Alternative Bagel (Western Bagel). Further, AIB-provided statistics for the 52-week period ending May 18, 2008, for refrigerated/frozen supermarket bagel sales for the top 10 brand names totaled US$50,737,860, based on 36,719,977 unit package sales. Price per package was $3.02 for fresh, $1.38 for frozen. The AIB reported US$626.9 million fresh bagel US supermarket sales (excluding Wal-Mart) for the 52 weeks ending 11 April 2012. Fresh/frozen supermarket sales (excluding Wal-Mart) for the 52 weeks ending 13 May 2012 was US$592.7 million. The average price for a bag of fresh bagels was $3.27; for frozen it was $1.23. Many cultures developed similar breads and preparations. The bublik in Russia, Ukraine and Belarus, and the obwarzanek (in particular obwarzanek krakowski) in Poland are essentially larger bagels with a wider hole. Similar to bagels, these breads are usually topped with sesame and poppy seeds. Other ring-shaped breads known among East Slavs are baranki (smaller and drier) and sushki (even smaller and drier). In Lithuania, similar breads are called riestainiai, or sometimes by their Slavic name baronkos. In Finland, vesirinkeli are small rings of yeast-leavened wheat bread. They are placed in salted boiling water before being baked. They are often eaten for breakfast toasted and buttered. They are available in many varieties (sweet or savoury) in supermarkets. German pretzels (which are soft and formed into rings or long rectangular shapes) are somewhat similar to bagels in texture, the main exceptions being the shape and the alkaline water bath that makes the surface dark and glossy. In Romania, covrigi are topped with poppy, sesame seeds or large salt grains, especially in the central area of the country. The recipe does not contain any added sweetener. They are usually shaped like pretzels rather than bagels. In some parts of Austria, ring-shaped pastries called Beugel are sold in the weeks before Easter. Like a bagel, the yeasted wheat dough, usually flavored with caraway, is boiled before baking. However, the Beugel is crispy and can be stored for weeks. Traditionally it has to be torn apart by two individuals before eating. Jean Brindesi's early 19th-century oil paintings about Istanbul daily life show simit sellers on the streets. Warwick Goble made an illustration of the simit sellers of Istanbul in 1906. Simit is very similar to the twisted sesame-sprinkled bagels pictured being sold in early 20th century Poland. Simit are also sold on the street in baskets or carts, as bagels were then. The Uyghurs of Xinjiang, China enjoy girdeh nan (from Persian, meaning round bread), a type of nan, the local bread. "Bagel" is also a Yeshivish term for sleeping 12 hours straight—e.g., "I slept a bagel last night." There are various opinions as to the origins of this term. It may be a reference to the fact that bagel dough has to "rest" for at least 12 hours between mixing and baking or simply to the fact that the hour hand on a clock traces a bagel shape over the course of 12 hours. In tennis, a "bagel" refers to a player winning a set 6–0; winning a match 6–0, 6–0, 6–0 is called a "triple bagel". "Bublitchki" or "Bagelach" is a title of a famous Russian and Yiddish song written in Odessa in the 1920s. The Barry Sisters together with the Ziggy Elman Orchestra made it popular in the US in 1939. Today it belongs to the repertoire of klezmer, jazz and pop musicians. In America, February 9 is often celebrated as National Bagel Day, in which people celebrate the rich history of getting together and eating bagels. ^ Columbia University NYC24 New Media Workshop website History of the Bagel: The Hole Story Archived 2011-08-22 at the Wayback Machine, retrieved February 24, 2009. ^ Filippone, Peggy Trowbridge. Bagel History: Bagels date back to the 1600s, About.com website, retrieved March 27, 2013. ^ Zinovy Zinik,'Freelance,' in Times Literary Supplement, Nov., 18, 2011 p.16. ^ Davidson, Alan (2006). Oxford Companion to Food (2nd ed.). Oxford, England: Oxford University Press. p. 49. ISBN 9780192806819. ^ Klagsburn, Francine. "Chewing Over The Bagel’s Story"[dead link], The Jewish Week, July 8, 2009. Accessed July 15, 2009. ^ Hevesi, Dennis (2012-03-22). "Murray Lender, Who Gave All America a Taste of Bagels, Dies at 81". The New York Times. Retrieved 2012-04-19. ^ Rothman, Lily (2012-03-23). "Murray Lender, the man who brought bagels to the masses". The Washington Post. Retrieved 2012-04-19. ^ "Murray Lender". The Economist. 21 April 2012. Retrieved 30 August 2012. ^ a b Adamson, M.W. ; Segan, F. (2008). Entertaining from Ancient Rome to the Super Bowl: An Encyclopedia: An Encyclopedia. ABC-CLIO. p. 94. ISBN 978-0-313-08689-2. ^ Parker, Milton; Freeman, Allyn (2005). How to Feed Friends and Influence People: The Carnegie Deli: A Giant Sandwich, a Little Deli, a Huge Success. Hoboken, N.J.: John Wiley & Sons. p. 97. ISBN 0471710350. Retrieved 2015-12-20. ^ Clark, Melissa (2013-09-24). "Setting Out the Bagels and Lox". The New York Times. Retrieved 2015-12-20. ^ Warner, Justin (2015). The Laws of Cooking* *and How to Break Them. New York: Flatiron Books. p. 83. ISBN 9781250065131. Retrieved 2015-12-20. ^ Reinhart, P., The Bread Baker's Apprentice. Ten Speed Press, 2001, p. 115. ^ Jonathan, Croswell. How to Keep a Bagel Moist, August 8, 2011. ^ a b "Top Bagels – Bagel Buying Guide". Consumer Reports. July 2012. ^ a b "The bagel". Bakers Journal. Retrieved 2018-07-15. ^ Spiegel, Alison (May 6, 2014). "Bagel Wars: Montreal vs. New York-Style Bagels". Huffington Post. Retrieved January 17, 2015. ^ Horowitz, Ruth (October 17, 2006). "The Hole Truth: Vermont's Bagel Bakers Answer The Roll Call". Seven Days. Retrieved June 9, 2011. ^ "Bagels, water and an urban legend". CNN. CNN. Archived from the original on 14 November 2015. Retrieved 18 May 2015. ^ Arumugam, Nadia. "Taste Test: Dunkin' Donuts' "Fake" Artisan Bagels vs Real Artisan Bagels". FORBES. Forbes. Retrieved January 1, 2014. ^ a b c d McDowell, Maya (2019-03-28). "In Defense Of The Bread-Sliced Bagel, From A St. Louis Native". Delish. Retrieved 2019-03-30. ^ a b "Bread-slicing Machine". National Museum of American History. Retrieved 2019-03-30. ^ "Apparently People Slice Bagels Like Bread In St. Louis And Honestly? WTF". BuzzFeed News. Retrieved 2019-03-30. ^ "Hometown Bagel, Inc". Retrieved 2012-04-20. ^ Mitzewich, John (August 6, 2012). "San Francisco-Style Bagels – Taking Things to a Hole New Level". Food Wishes. Blogger. Retrieved August 7, 2012. ^ "New York Style Baked Snacks". Newyorkstyle.com. Retrieved 2018-03-26. ^ a b AIB International, Bagels 2012. Data obtained from SymphonyIRI Group from scanner data from Supermarkets, Drugstores, and Mass Merchandisers (does not includeWal-Mart). ^ Collins, Bud; Hollander, Zander (1994). Bud Collins' Modern Encyclopedia of Tennis (2, illustrated ed.). Visible Ink Press. pp. 484–485. ISBN 978-0-8103-9443-8. ^ "Home". National Bagel Day. Retrieved 2018-03-26. Wikimedia Commons has media related to Bagels.